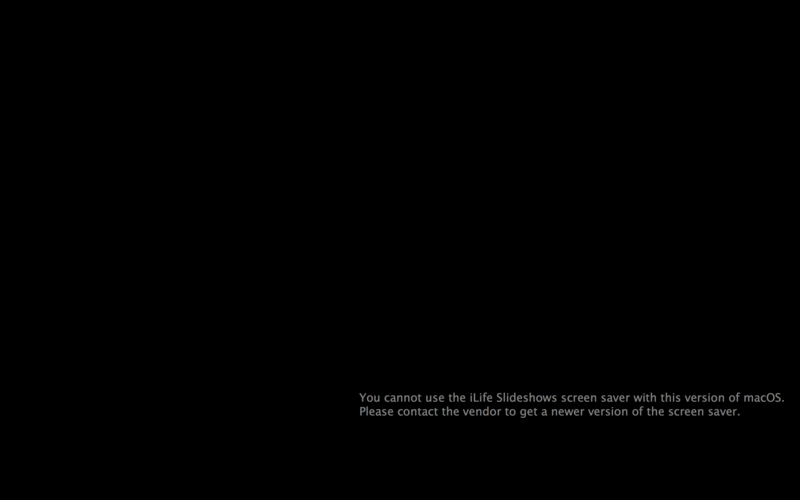 "You cannot use the iLife Slideshows screen saver with this version of macOS. Please contact the vendor to get a newer version of the screen saver." Also my screen saver preference pane have stopped working - it simple does not switch to that screen when I click the "Desktop - Screen saver" button. I have tried setting the screen saver using the terminal and the defaults command to update the plist file. I ended up reinstalling my OS, so it's a solution, a bit drastic perhaps, but very effective. I went into my Hard Drive (at the bottom of the Finder left hand list) > Library > Screen Savers and moved that folder to the Trash. Then I went into one of my Timemachine backups from a time when I was able to tap into my Photos and selected that same folder from within Timemachine and clicked Restore. And voilà! My own wonderful photos are back & flipping around my screen saver. Not the answer you're looking for? Browse other questions tagged macos screensaver .